The connection between hiphop and Christmas goes back to the early days of hiphop (or rap music as it was still called in those days), the late 1970s and early 1980s. The first rap record that was released on a major label in the United States was a Christmas song. We are of course talking about Kurtis Blow and 'Christmas Rap' here. And, believe it or not, 'Christmas Rapping' (not a cover) by Dizzi Heights (or Dizzy Heights, the spelling differed between pressings), was the first UK rap record. Both songs had more in common than the fact that they were 'firsts' and that they both had 'Christmas' and 'Rap' in the title. Musically, both songs were rooted in disco. The record labels in these early days of hiphop were afraid that this new style of 'singing' was already weird enough for most of the record buying public. Disco was at least a familiar music style and was also popular by the white audience. And as Christmas music had a long tradition of novelty songs, the majors saw this as a safe way to test if the record buying public was ready for this new style of music. It turned out the English were, as 'Christmas Rap' managed to enter the UK singles charts and reached number 30. For the American record buying public, it took a little bit longer. 'Christmas Rapping' charted for the first time in the US in 1993, in the R&B Charts. But by that time, hiphop had already become widely accepted. Dizzi Heights was not as successful as Kurtis Blow with his Christmas single, as it did not chart at all. It is now almost 40 years since 'Christmas Rapping' was put out, and over the years, hiphop has become one of the most popular music styles – even in many others styles of music, the influence of hiphop is very much present and I am not only talking about R&B and soul here. The connection between Christmas music did not end with Kurtis Blow and Dizzi Heights. On the contrary, many rappers have tried their hands on Christmas song. The classic hiphop Christmas song is, without any doubt, Run DMC's 'Christmas In Hollis'. It was first released on the 1987 compilation 'A Very Special Christmas', the first edition of this popular compilation series. 'Christmas In Hollis' was also released as a single, in the UK in 1987 (in a gatefold sleeve with the same Keith Haring artwork as the album had) and reached number 56 in the UK singles charts in December 1987. The song saw it's first US single release one year later, when it was teamed up with another fine Christmas rap song, female rapper Sweet Tee's 'Let The Jingle Bells Rock'. Both songs were also included on one of the first Christmas hiphop compilations, 'Christmas Rap', that was already released ithe previous year. It was well into the 1990s before Run DMC's 'Christmas In Hollis' would chart in the US R&B Singles Charts– although only for one week (#80 on January, 9, 1999). The popularity of Run DMC's 'Christmas In Hollis' is not only illustrated by the 8,5 million views of the video of the song on Youtube, but also by the re-release of the 7” for Record Store Day Black Friday 2014 (where it came with a playable Christmas card) and a re-release on a picture disc 12” two years later, again on the occassion of Record Store Day Black Friday. This Record Store Day Black Friday also saw the release of a hiphop 7”, although I don't think this one will get the same legendary status as the Kurtis Blow and Run DMC's singles. Although that does't mean it is bad. Twiztid is already around for 20 years, and consists of Jamie Spaniolo (aka Jamie Madrox) and Paul Methric (aka Monoxide). The duo is based in Detroit, Michigan, and has already released seven albums over the years – of which some have reached the Billboard Album Top 10. 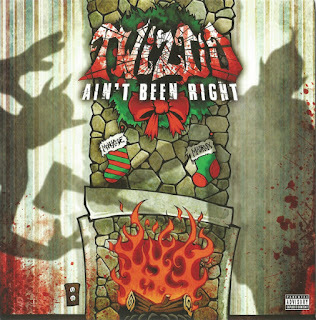 After their formation, Twiztid signed to Psychopathic Records, the label of the Insane Clown Posse, probably the most well-known and succesful band in the horrorcore genre (who, by the way, re-released their 1994 Christmas EP 'Xmas' on 7” for RSD Black Friday last year). Twiztid became one of the most succesful groups on the label. Their records also received a lot of praise from critics. That Twiztid had something with Christmas was already clear in 2011, when they released their Christmas EP (on a CDr) 'A Cutthroat Christmas'. The EP was re-released on vinyl in 2016. By that time, Twiztid had left Psychopathic records and formed their own label, Majik Ninja Entertainment. Their 2017 Christmas single, 'Ain't Been Right', is also released on that label. The single reprises one song of the 2011 Christmas EP, 'Sad Christmas Song'. A-side 'Ain't Been Right' is a new song. Twiztid is a band that is not only influenced by hiphop, but definitely also by rock. Kiss is mentioned as one of their influences: and that's not only because of the similar black-white facepaint Twiztid uses. The rock influences are clearly present on 'Ain't Been Right', not only because of the guitars that feature promiment in the backing track (the start of the songs even sounds like a rock ballad), but also because of the sung refrain. I have to say I can't really figure out what the song is about: their rapping goes a bit too fast for me. B-side 'Sad Christmas Song' features their pal Blaze Ya Dead Homie, who was also featured on their very first 1997 demo, that got them signed to Psychopathic. This song has a more 'traditional' hiphop sound. It doesn't exactly paint a pleasurable picture of Christmas. It is about the Christmas of the people who are giving through a tough time, those who 'got no money, got no job and got no reason to be celebrating', who 'seem to be in a hopeless situation. 'Christmas blues', as they sum it up in two words. With a lot of swearing, killings and pistols shots, this is not exactly a 'let all people live in peace and harmony Christmas'-song. But well, it isn't called horrorcore for nothing, is it? The single was released in an edition of 500 copies, all on transculent green vinyl. It's something different than most of the other Christmas 45s this year, and just for that, I like it. But the music is good, too, so I will be playing it a few times this Christmas.